How an ultracivilized country, one of the most European in Latin America, relapsed into near-barbarism in the 1970s. Argentines ask how their ultracivilized country, reputedly the most European in Latin America, could have relapsed into near-barbarism in the 1970s. This enlightening study seeks to answer that question by reviewing the underlying political events and intellectual foundations of the "dirty war" (1975–1978) and overlapping Military Process (1976–1982). It examines the ideologies and actions of the main protagonists—the armed forces, guerrillas, and organized labor—over time and traces them to their roots. In the most comprehensive treatment of the subject to date, Hodges examines primary materials never seen by other researchers, including clandestinely published guerrilla documents, and interviews important actors in Argentina's political drama. His wide-ranging scholarship traces the origins of the national security and national salvation doctrines to the Spanish Inquisition, sixteenth-century witch hunts, and nineteenth-century reactions to the modernizing ideologies of liberalism, democracy, socialism, and communism. 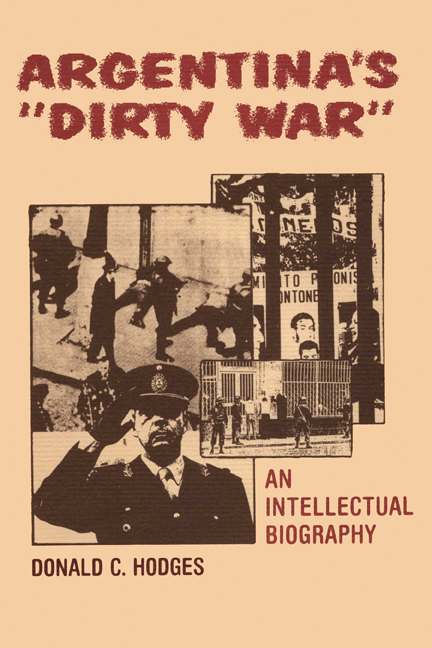 Hodges posits that the "dirty war," Military Process, and revolutionary war to which they responded represented the culmination of social tensions that arose in 1930 with the launching of the Military Era by Argentina's first successful twentieth-century coup. He offers the disquieting hypothesis that as long as the "Argentine Question" remains unsettled the military may intervene again, the resistance movement will remain strong, and violence may continue even under a democratic government. Donald C. Hodges (1923–2009) was Professor of Philosophy and Affiliate Professor of Political Science at Florida State University.